Google Maps on Android and iOS now has a new transportation option. If you live in a country where French startup BlaBlaCar operates, you can now open the BlaBlaCar app and book a ride straight from Google Maps. Google isn’t adding a new tab just for BlaBlaCar. Instead, BlaBlaCar appears as a new option in the public transportation tab. For instance, if you’re looking at ways to go from Paris to Lyon, Google Maps suggests taking the TGV train — and now also BlaBlaCar. 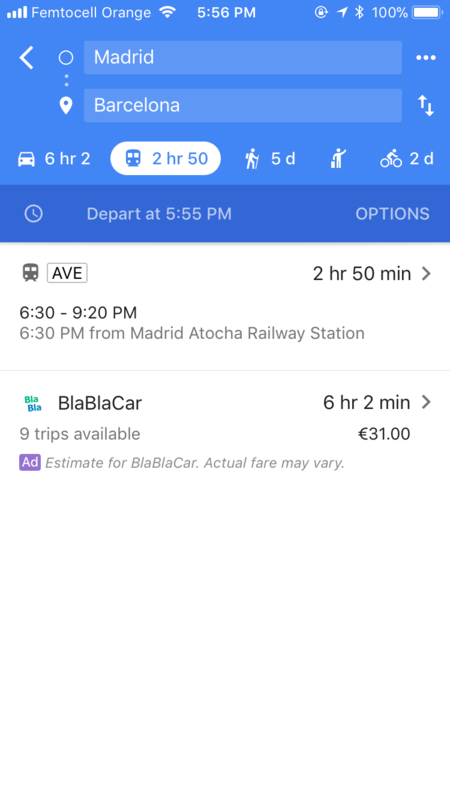 The app gives you an ETA for each transportation mode so that you can compare how long it’s going to take if you opt for the train or BlaBlaCar. Google Maps uses the same ETA for BlaBlaCar and a normal car ride. It also estimates the cost of a BlaBlaCar ride. BlaBlaCar is a ridesharing service for long-distance rides between two cities. It has tens of millions of members in dozens of countries. Think about it as a sort of Airbnb for carpooling. When you are driving from one city to another, BlaBlaCar can help you find people for those empty seats in your car. Conversely, if you’re looking for a cheap transportation option, you can open the BlaBlaCar app or website and book a seat in someone’s car. The startup takes a cut on each transaction. With today’s integration, if somebody books a ride through Google Maps, BlaBlaCar is paying Google a small referral fee. Google Maps also integrates with Uber in its own dedicated tab. BlaBlaCar doesn’t get its own tab, but it should still help a bit when it comes to growth and engagement.